So my adventures into European candy continues. After the last two being totally disappointing I figured I would go with a company that I tend to trust, Ritter Sport. I haven’t had too many candies by these people but the one or two others that I have tried are tastie, and the Cappuccino bar turned out to be the same. 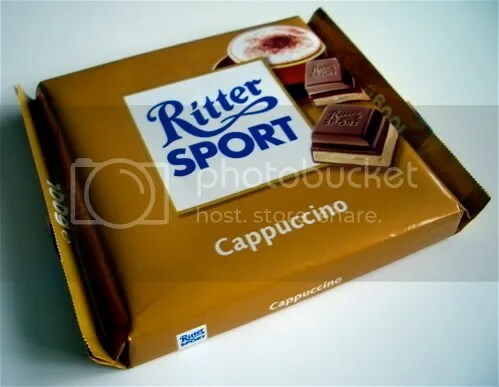 So the Ritter Sport Bars are all square with smaller squares carved out within the bar (think of how Hershey’s bars are, but with squares). I have had the RS with Corn Flakes before, and didn’t really know what to expect with the cappuccino. The corn flakes are easy, they are just dispersed through out the bar as a peanut or almond would be, but the cappuccino was much different. While the bar is divided into smaller squares, each is not filled with cappuccino flavor, rather the cappuccino is is a full layer throughout the bar. When you break the bar, the pieces don’t break clean…rather the milk chocolate breaks in chards around the cappuccino filling. The bar itself is extremely creamy, and while not 100% natural (some artificial flavors…which I guess is my only complaint about the bar), still very convincing with the coffee flavor (some can taste fake, but this one does a pretty good job pulling off real coffee). I guess the closest thing that I can think of that this bar reminds me of is Ben and Jerry’s Coffee ice cream. While it is a candy bar it possesses the creaminess of the ice cream. The flavor is extremely intense, and I find that I can only handle one or two of the small squares at a time, but they leave me very satisfied. So my interest in European candy got me to pick up another, and my I say disappointing, candy bar. This time it was the Yorkie “It’s not for girls” bar made by Nestlé (which was originally made by Rowntree’s of York). I picked it up at the checkout at Fairway Market in Harlem (only 99 cents). So first off I wanted to know why it wasn’t for girls…the package says it is chunky milk chocolate…ok sounds good. 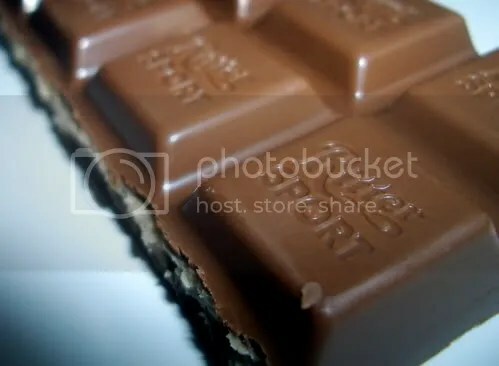 So the candy bar itself is divided up into five chunks of chocolate. I broke one off and took a bite. While it was a thick milk chocolate bar, that was all it was…no chunks of anything anywhere to be found (KLK thought it was awful, and said that the boys could keep it). Milk chocolate is great, but this really wasn’t special…maybe even a little cheap tasting(well it was cheap so what could I expect). I guess the chunk they are referring to is the size of the chocolate itself. Sad. I should preface this review by saying that, in general, I am not a big gum person. I think it’s pretty gross when people smack it real loud with their mouths open, and I don’t like the taste of most gums, and it’s kind of expensive, and I’m sensitive to that aspartame crap that they put in most gums today. Tom used to be a big gum chewer when we first started dating, so I guess I chewed a little bit then (maybe for fresh kissing-breath after all of those vanilla soy lattes we were drinking – HA!). But, I never buy gum. UNTIL NOW!! I saw this gum at my pharmacist, which is right around the corner from our building. It’s the best pharmacy I’ve ever used, and one of the reasons why I love my neighborhood. When I went in for the first time, the pharmacist himself came out from behind the counter to shake my hand and tell me how nice it was to meet me. I tell you what – I will NEVER go to a Rite Aid or Duane Reade or Eckerd or whatever after this great experience. They even have our toothpaste at a reasonable price, which is kind of hard to find in Inwood. Choward’s Scented Gum initially looked interesting to me kind of from an aesthetic standpoint. I really liked the little purple cardboard box, and the writing on it and the weird name and everything. It looks really old-school, which always appeals to me. And here it was up at the counter of my little independently owned pharmacy (“the corner druggist”), so I was pretty sold from the beginning. Also, since when is gum called “scented?” The outside of the box says, “FRAGRANCE THAT REFRESHES.” Yum! But, shouldn’t it say “FLAVOR THAT REFRESHES?” It’s weird to think of something that you eat having a scent. Needless to say, I was intrigued. I finally bought it during my third visit to the pharmacy, and popped a piece immediately after going outside. The flavor was so surprising! It has kind of a clove-y, herbal, not really minty flavor. There’s a little bit of cinnamon in there in the beginning, but that fades pretty quickly. Most of the flavor fades pretty quickly, actually, but in a very pleasant way. The gum is very small, so you aren’t forced to smack it around loudly with your mouth open like most people do with gum (totes annoying!). The aftertaste is perhaps the most surprising part….patchouli. Yes, patchouli. I must say I have a sweet spot inside for patchouli-scented things because of my hippie days in college. It smells delicious and earthy. I actually enjoy having that flavor in my mouth! Weird, right? Choward’s gum is kind of expensive at the drugstore, at $0.79/pack. One pack contains eight pieces. I am seriously considering buying a case directly from the company, at only $13.50 for 24 packs, that’s a pretty sweet deal. Less than $0.60 a pack! Sounds like a great graduation gift to me…..